So as of 13th of January, 2016, Blizzard has sent out a new wave of invites for the World of Warcraft Legion Alpha to a whole bunch of players, way outside of their Friends & Family. This might be a very good strategy to ensure players now have enough time to point out bugs and issues way before Legion’s release and even before Beta, thus making it a better experience than the Warlords of Draenor launch, hopefully. Now, of course, with every such wave, there is a large player base complaining and “theorycrafting” Blizzard’s strategy of sending out invites to find out the reason why they haven’t gotten one or why someone else did. One of the reasons which stood out the most this time was that they’ve sent invites only to “players who have 13/13 Mythic on farm”. I’m not sure if that bares any truth, however, I doubt it. I, myself, am a 13/13 Mythic raider with a decent world top and I did get the Alpha invite, however, a few of my guildies did not, despite meeting the same criteria as I do. I have not pre-purchased Legion yet, so that clearly doesn’t matter. While on this topic, I’d like to point out that there are a lot of players who had multiple offenses on their accounts, some of them even perma banned for months which still managed to get the WoW Alpha Legion invite, so it’s hard to figure out which algorithm they’ve used to send out the invites, but I’m sure it has little to do with your in-game raiding progress. You might’ve received an invite yourself and have no idea about it, since there is no mail notifying you that you’ve been selected for the Alpha. 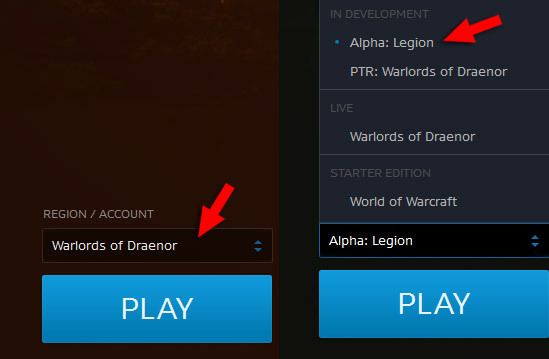 What you need to do is to check your Battle.net Launcher Client if it’s eligible to install Legion Alpha, by clicking the “Region / Account” tab on top of your blue “PLAY” button. If “Alpha: Legion” is there, congratulations, you can install it and play it! If not, well, maybe you’ll get lucky the next wave! Now, if you’re among the lucky ones to get in the Alpha, you can check out this infographic to see what’s available and what limits you have inside the game for now, as well as to stay posted whenever something new is added. While I know everyone is excited to figure out things before others, quick leveling ways and what not, we must bear in mind that this is merely Alpha, so not even Beta, and there will be plenty of disconnects, bugs, crashes, rollbacks and so on. 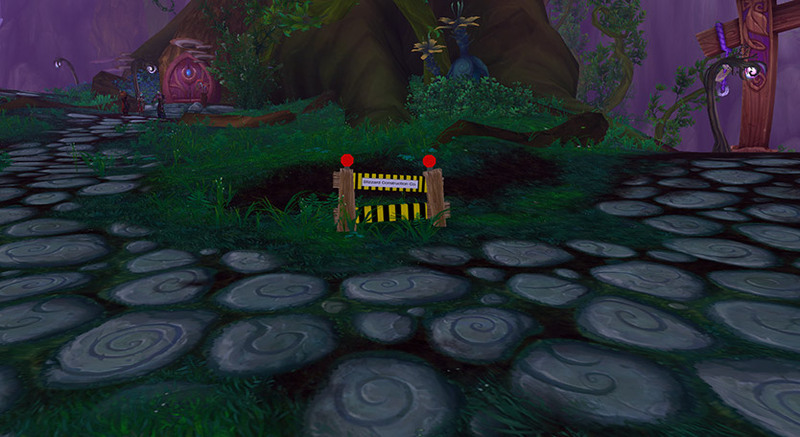 One annoying thing I’ve had to deal with was going through a quest portal and immediately after coming on the other side, getting disconnected. Now no matter what I do, my character gets instantly disconnected upon logging in, so I had to just make another one and start from scratch. As a helpful tip, whenever you make any interface changes in the Alpha, such as assigning spells on action bars, keybinding them, making macros and so on, remember to log out and back in right after, so they get saved, otherwise if you get disconnected shortly after you’ve done changes, you’ll find most, if not all of them, missing and rolled back. Another thing is, if a quest you’re doing doesn’t click well or doesn’t start / end properly, don’t spend too much time walking around trying to figure it out, since it’s most likely bugged. Just abandon it and pick it back up. Remember that Blizzard’s Customer Service is unable to assist you with any issues you might run into while on the Alpha, so you’re on your own, basically. If you’d like to check all the new updates the current WoW Legion Alpha build has brought, Wowhead has done an awesome job compiling this list, so go check it out! Basically, even if most of us want to test out the game only for our own gain, we need to remember that these invites were given to us to help making World of Warcraft a better game and experience, so keep an eye on any bugs / phasing issues and such that you find, and point them out to Blizzard by clicking Help and Submit a Bug, and hopefully we won’t have to deal with annoying phasing quests that don’t work properly in the actual Legion release! All in all, so far it looks pretty cool, and I really hope they’ll keep improving it, however, I don’t like most of the class changes, but what can you do. If you’ve enjoyed this blog post, have any suggestions or even want to share with us your Alpha experience so far, please don’t hesitate to drop a comment!